BITSAT Admit Card 2019: Birla Institute of Technology and Science (BITS) will conduct BITS Admission Test (BITSAT) in the month of May, 2019. To appear in the BITS entrance exam, candidates will have to download the BITSAT Hall Ticket. The downloading process of admit card will start from 2 week of April after booking the exam slot for BITSAT. The admit card is very important document as it represents our self. It contains all the important detail like candidate’s identification, exam center, exam timing, exam date etc. Don’t forget to bring the BITSAT Exam Admit Card while appearing for the examination. Candidates should follow all the instructions written on the admit card. The admit card will be released in the month of April on the official website. It will be available for those candidates who will submit the BITSAT application form within the deadline and also book the exam slot with date & time. To get permission to enter in the examination hall, candidates need to download the BITSAT Admission Card. 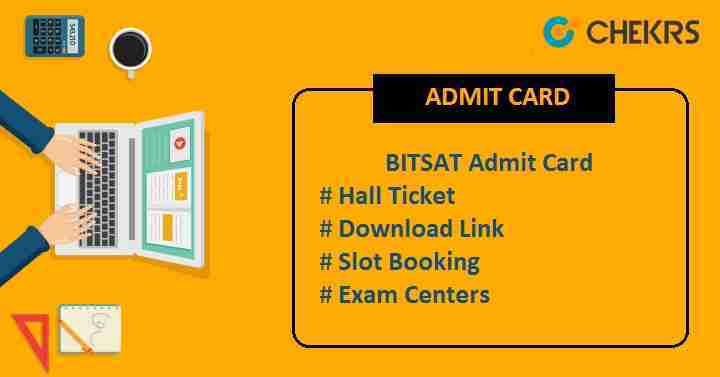 Check here the expected date of BITSAT Admit Card Date & Slot Booking. Click on the link given there for the admit card. Enter the details like application no, date of birth, gender & email ID and then submit it. BITSAT Hall Ticket 2019 will be displayed on the screen, download it. BITS, Pilani offers to book the exam slot, date and time for BITSAT exam. BITSAT Slot Booking process is online process. A link will be activated on the official website to book the slot. Candidates will have to go to the link and then login to their account with the login credentials. Slots are given on the basis of first come, first served. To get the slot of your own choice, must visit the site early. If the candidates forget to participate in the slot booking process, then slot will be allotted by the institute. Click on the link for slot booking available on the official BITSAT website. Enter your application no, date of birth, gender, email id and then click on “Proceed” button. Choose exam center, test date and select test time and then click on “Confirm Slot” button. The confirmation page will be shown on the screen. If you want, you can take the print of it. Candidates should choose at least 3 preferences for BITSAT 2019, in which at least one preference must be BITS, Pilani or BITS, Hyderabad. Carry one valid ID proof (Voter ID card/ PAN Card/ Aadhaar Card/ Driving License) along with the admit card. Check the all details mentioned on the admit card, if any discrepancy found contact to the officials immediately. We hope this complete article on BITSAT Admit Card & Slot Booking is sufficient and useful for all the candidates appearing for the BITSAT in the year 2019. Good Luck & Keep visiting our website.